The book is not early because Paul is gone. There is no indication of his presence among the churches of Asia Minor in the letters that occupy the first couple chapters of Revelation. For Gösswein that arguable textual fact slides right into the assertion that “all of the apostles had gone home except for John.” I do not think that follows necessarily from the absence of Paul in Asia Minor, but since this series is about Gösswein’s hermeneutics and not my own, it is by the by. The book is not early because early church tradition (no particular text is cited by Gösswein) says unanimously that Domitian banned John to the island of Patmos, whereon John received the Revelation. This happened near the end of Domitian’s reign, which is where Gösswein gets his AD 95-97 since Domitian died on 18 September 96. The book is not early because the churches have lost their first love. Gösswein’s rhetoric is impressive and densely Scriptural on this point. John’s words are meant to recall, to reassemble, and to firm up the failing churches descending into every kind of vice and heresy. Of the three points, 1) and 3) are rather difficult to prove. 1) is an argument from silence, whereas John may have ignored Paul or Paul could have been entirely elsewhere (Spain or Rome, for example). 3) has the advantage of referencing the loss of first love John attributes to the Ephesian church (Rev. 2:4) but may create a unity of affect or concern where none exists. Not every church is soundly rebuked. Some are worse than others in their moral condition or delusions. 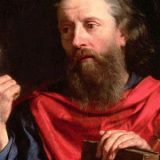 And if one holds 1 Corinthians to be among Paul’s earliest or his earliest letter, there is no obstacle to believing that the church has been beset by all manner of problems from its inception. 2) is Gösswein’s strongest case for his dating of Revelation, but he spends comparatively very little time on it, despite its historical pedigree, which he does not mention. The first [section] (ch. 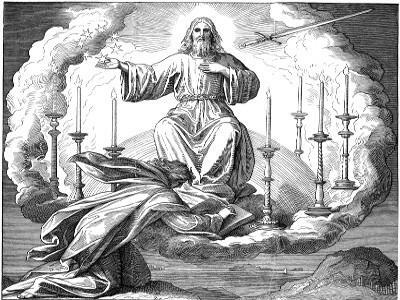 1:9-3) presents to us Christ as the Governor of the church, who walks among seven golden lights, and shows us how he governs seven congregations with his words. The second (ch. 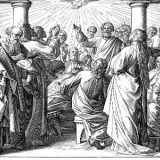 4-8:1) reveals him as the King who has the future in his hands and who also so rules the world that all sorrow must serve his church for the best. In the third (ch. 8:2-11) Christ appears as High Priest in his holy church, who will not let the church’s borders be overwhelmed, though seven trumpets call awake entire armies of erring spirits. The fourth paints Christ’s battle with the dragon, the world power hostile to God and the antichrist, in general outline down to the destruction of the enemies (ch. 12-14). The fifth section (ch. 15-19) shows God’s judgments upon the enemies unto the satisfaction the wrathful righteousness at last finds and the song of triumph to which the elect give voice. The sixth section (ch. 20) reveals how Christ has the dragon on a chain, until he throws him into the eternal murk, so that that dragon cannot any longer hinder the building up of the church, as Christ has permitted [hitherto]. The seventh section gives a physical pictures of the fulfillment of the kingdom of God. With it the entire Holy Scripture concludes, whose beginning speaks of creation and fall and whose ending speaks of rebirth (Mt. 19:28).